10 PRINT CHR$(205.5+RND(1)); : GOTO 10 is a concise and elegant single line of code written in BASIC for the Commodore 64 sometime in the early 1980s. When run, it produces a maze-like pattern on the screen in an endless loop. Sven Dahlstrand rewrote this one-liner for the original Game Boy, written in assembly language using the RGBDS toolchain. ROM, source, and documentation are freely available. Thanks to Sven Dahlstrand for the hint! Squishy the Turtle by cppchriscpp is a puzzle game written for the Nintendo Gameboy. It was originally created in 48 hours for Lundum Dare #34 and updated for MAGFest 2018. 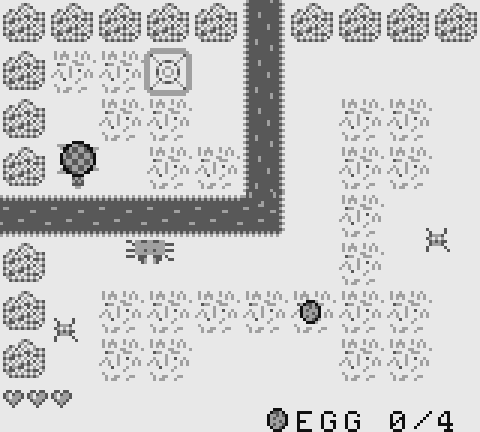 You play as a turtle, who must collect his eggs while avoiding the spiders and crabs covering the landscape. Blossom is a meditative Game Boy program by colorful_courier. Squishy has a special power – he is able to grow and shrink at will. Some places will only be accessible by Squishy in either form. The rivers are infested with piranhas, so squishy must be big when crossing them to avoid piranha bites. Likewise, there are tiny spaces (like portals) that the big, slow form of Squishy cannot fit through. Spiders are also afraid of the big squishy, but crabs seek after him for food. Can you collect all of the eggs and get to safety? 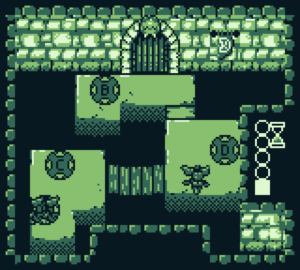 Mona and the Witch’s Hat is a homebrew game by Thomas Neptune and Sergeeo made for the original Game Boy. You play as Mona, a mischievous cat that gains magical powers when her owner’s witch hat falls on her head. It features four levels, and can be completed in about 20 minutes. What a peaceful day! As the sun sets and the moon begins to shine its light over the village, a young witch finishes her busy day of potion making by hanging her hat and going to bed. Her cat, Mona, doesn’t want to go to bed though. She’s more interested in the treats the Witch left out! But things don’t go as planned when the Witch’s hat falls on Mona’s head and everything comes to life. Now she has to turn everything back to normal!